My daughters LOVE Christmas! They start making lists in August and they look forward to the holidays with GREAT anticipation. We don’t buy a lot of gifts. We do birthday celebrations and big (to us) Christmas celebrations. Other than a few small things sprinkled in here and there, this is the only times that we give gifts. They do earn chore money so that they can buy themselves things that they see but it takes quite a while to earn enough for big things. Other than that, we take a quick photo of the items that they see and wish for and tell them we will “put it on their list.” I am so thankful that they are not spoiled or demanding. So the holidays are very exciting for them! They are also exciting for my husband and I because we love to give them gifts. My ten year old started making her list (seriously) two weeks ago. She’s been playing around with MS word so her list includes pictures and prices of her items this year! Ha! She wants to make sure that there is no mistaking what she wants. Smart girl! She fell in love with a Clydesdale horse from the Our Generation doll collection. These horses can normally be found at Target for $45. 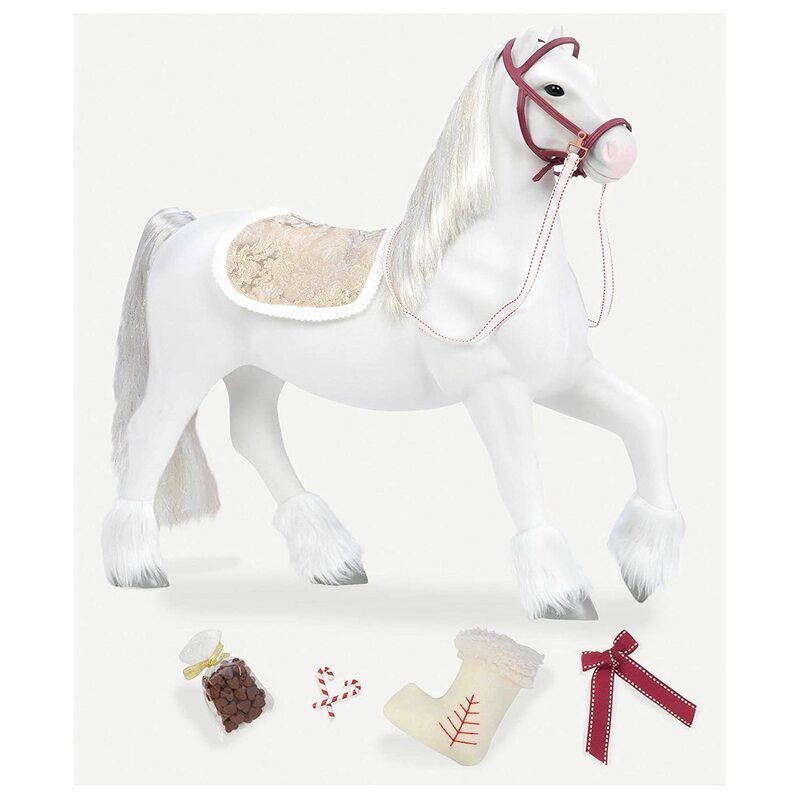 Except for this particular horse because he was part of last year’s holiday collection. So…..now he can be found on Ebay for about $100. Now this is my frugal minded child who decided that she wouldn’t ask for an American Girl because she could get an Our Generation for about 1/5 of the price. But she searched and searched out this horse from every source possible. She realized that he was very expensive and more than once I caught her at the computer with misty eyes while she processed that she might not be getting this one particular horse. I told my husband and we did a little searching of our own and found him for $75 through a third party vendor with Walmart. Ahhh….he arrived yesterday and I just can’t wait to see her open him on Christmas morning. I started thinking about this gift…..this $75 piece of plastic that my daughter will delight over for such a brief time. That’s not why I bought the horse. We know that her desire to play with him will be short lived in the big picture. I bought him because I love the girl that desired the horse and I want to give her good gifts. In a much greater way, this reminded me of God’s love. The Bible tells us that he loves to give us good gifts. It is hard for me to process that He loves us more than I love my children, yet I know it’s true. Thank you, Lord, for delighting in us and giving us your good and perfect gifts! Have you ever driven along a familiar road of your childhood with your kids in the car? I have many times and I always find myself pointing out the window to show them things that hold memories for me. Scents and scenes have the ability to bring those memories forward in my mind. A fall wind, the salt in the air near the ocean, the sound of a horn in a tunnel when we are on a trip….all linked to memories. When I drive around in my hometown, I can remember little bits that I share with my kids and my husband. Recently, I showed them the movie theater in my hometown of Louisville, Mississippi and told them that parents would park around the corner to pick up their kids so that we wouldn’t “be seen” being picked up. So strange…since obviously none of us could drive ourselves there. That was obviously many years ago, as the theater is now listed as a historic site! I can still smell the almond flavoring of petit fours when I think of a little pastry shop we visited on occasion after school. There was a screen door with a bell that alerted the owners of a customer and you could smell the deliciousness long before stepping inside. Memories….things to share as a glimpse into my life. Things that no one else would remember if I didn’t tell them. I’m currently going through the book of Joshua as part of a Bible Study Fellowship called People of the Promised Land. We just finished the chapter in which the Israelite people had just crossed the Jordan River. They were instructed to take stones and build an altar so that they might tell all who looked upon it in the future of what God had done. I started thinking about the hundreds of times when God has been faithful to me. Probably far more than I can even recall after time has passed. Maybe it’s time I start writing them down and constructing a little stack of “memory stones” so that I can not only remember myself but encourage others. As I look back, I can remember that God was faithful and He will continue to be. Whether I write them, build a physical monument, or just revisit them in my mind, let me park my mind on where God has shown up over and over. Let me be thankful and let me tell others! My son built this while we were hiking in Gatlinburg. It’s been ten years since I’ve had a tween. My first two tweens were boys. I think the greatest challenge might have been keeping them in pants that were long enough and shoes that still fit. Helloooo….10 year old little girl! Wow. The mood swings, the crying, the drama. It is not for the faint of heart. What happened to my kind, caring, cuddly little girl? She does show up every now and then but you can’t be certain when those times will be. The hormonal version shows up suddenly and without warning. She might jump into a board game, hop into the backseat, or reveal herself in the middle of a math problem. There are a few things that calm her a bit. Sometimes food settles her. A hot bath can help. Usually it’s only sleep that makes her flee. She can certainly cause turmoil in what was a normal day. She blows in like a hurricane and exits behind a locked door. To everyone’s relief, “she” usually doesn’t hang around for an entire day and the loving, kind version of her returns. Sometimes it is a challenge to accept this phase for what it is. A phase. This, too, shall pass. But what to do? Are these years simply to be survived? Should we just buckle up and hang on, hoping that this is similar to a roller coaster ride that we will soon step away from, still intact? Working with middle school students for so many years as a teacher has given me a little bit of insight. Strangely enough, I’ve had to remember how I dealt with other people’s tumultuous children in order to deal with my own. As much as it upsets the household for out of control tween girl to enter the scene, it upsets that little growing girl more. Having mood swings and dealing with such confusing thoughts and emotions is a tough job. It’s tiring for everyone involved. It is a confusing time. Yesterday she was playing with Barbie dolls and today she’s noticing underarm hair. She’s in this body that’s changing and it’s hard to know exactly where all of those things fit into “who” she is. Remind her of her worth. We haven’t reached the acne and oily skin phase yet but I know that it’s coming. My husband has done a great job of always reminding the kids that their most beautiful feature is their heart. That might be tough for her to remember when she glances in the mirror but plant those seeds anyway. Daily. Cheer her on. Sometimes you can’t cheer her up. You just can’t. If I’ve learned one thing in parenting (or in any other relationship), it is that you can’t make other people happy. Encourage her through the rough patches and tell her that soon enough, she’ll come out on the other side of this stronger and more capable. Teach her. In my opinion, one of the most uncertain times of a girl’s life is when she just doesn’t know what or how to do something. It is hard to be the person who “just doesn’t know.” Don’t let her find out about how her body will change during PE or gym class. Spend some time talking with her about it. Hopefully, she fully trusts you to have her best interest at heart. If you don’t have that bond already, it is not too late. Start talking. If she wants to know how to do something like shave her legs, don’t let her be the bandaid wearing girl who butchered her knees. Show her. Not in a big deal, weirded out kind of way but in a simple, lighthearted way. This helps it not to feel so awkward. What about you? How are you making these transition years tolerable wonderful?